Diwali!!! It is all the more beautiful in Jaipur!!! Specially Bapu Bazar looks so beautiful then!!! That's a nice shot. Diwali lights always come in handy to test night time photography. I love Diwali. My friends invite me to thier houses and we hang late night crack a lot. The festival of light is so delight. @Afshan - Very true. We usually don't go out in the town area when it's too crowded, but I could get some really awesome Diwali light photos if we did! @Naina - Yupp... and the Diwali diyas all lit up! 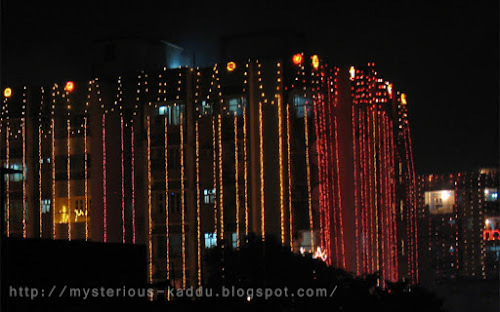 @Shilpa, we only went as far as Amrapali circle to check out the lights... and wow! Some of the lighting there was just brilliant! Can't even begin to imagine what the rest of the town must have looked like! Oh yes, Arshad... it is a fun festival! lovely way to decorate an entire building for Diwali. Nice. Balcony and car photography are the best! And most of mine are taken from my phone. :) It is amazing how you got such clear night shots. It's so nice that everyone is doing their own unique Diwali, no pictures are alike. Lovely this one! @Pixie - Yeah it really does look colorful, doesn't it? @Jyothi - I just found your comment on this post in the spam folder! Really strange. Blogger spam filters are becoming unreliable now I guess. I don't get too good pics from my phone, but my camera is good, ya... even though it's a really old one. It's night-mode is quite decent... I took this pic without flash in the night-mode setting of my camera.